I used the outside part of the black diecut page as a border. It is meant for scrap, but if you cut them apart you have 4 ready made borders. This kit is just perfect for those pumpkin photos. I also used my Silhouette cutter to create the cute little pumpkins. I backed them with black cardstock so the designs would show through. The 3-in-1 Beacon glue is great for adhering the black cardstock behind the decorative pumpkins. 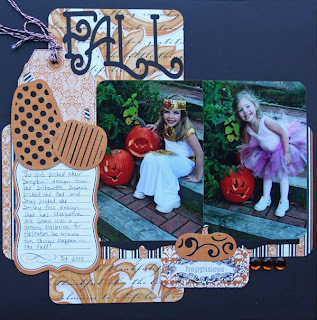 It is also great for adhering the “Fall” title. WOw, so very beautiful! THanks so much!